In the 1920s and early ‚Äô30s, while Prohibition was dampening spirits in America and parts of Canada, European high society was openly enjoying a creative mixture of alcoholic beverages. And voila, the cocktail hour was born, although it‚Äôs endlessly debatable as to when the first liquid cocktail was invented. On both sides of the Atlantic, the glitterati of the day needed a sophisticated place to drink, either in secretive underground clubs called speakeasies or in the semi-private cocktail bars of glamorous hotels. Glittering chandeliers, crystal glassware, and gowns competed for attention with diamond jewellery. 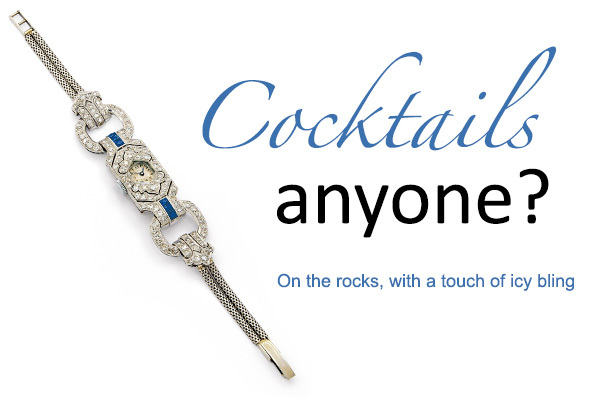 Broadly speaking, any bejewelled wristwatch could be termed ‚Äòcocktail‚Äô and worn by fashionable women in the evening. It certainly stands to reason that the rum-running smugglers who were amassing great fortunes selling illegal booze might have gifted their respective wives, daughters, and yes, maybe even mistresses, with a pretty diamond wristwatch or two. There was once a theory that a real lady wouldn‚Äôt wear a timepiece to any formal occasion‚Äîit would be the height of rudeness and poor etiquette to glance at the watch, indicating boredom or worse, wanting to be somewhere else, possibly having another more important meeting or exciting assignation. Yet, in the 1930s, etiquette expert Emily Post granted permission to women of good taste and breeding to wear cocktail, evening, dinner, or dressy bracelet watches, as they have variously been called. Signed Patek Philippe with pave-set diamond bezel and dial accented by channel-set emerald corners and emerald numerals. Bracelet decorated with pave-set diamonds and channels of square diamonds. 18-karat yellow gold, case, movement, and clasp. In Europe, the Verger Bros., were the dominant suppliers of cases, while European Watch and Clock Co., provided the majority of movements for the best jewellery houses, including Cartier, Tiffany & Co., Van Cleef & Arpels, Boucheron, Ebel, Movado, and Mauboussin. Each group signed and marked their specific part, so it wasn‚Äôt uncommon to see different makers‚Äô names pertaining to the case, movement, or dial. Expertise came from the co-operative efforts of the Swiss and French. Cartier, for example, used movements from Vacheron & Constantin, Audemars-Piguet, Movado, and Jaeger-LeCoultre. The mechanically precise manual winding movements commonly consisted of 17 or 18 jewels. Jaeger-LeCoultre technicians brought revolutionary changes: in 1929, the ‚Äò101 calibre‚Äô movement allowed for miniaturization of the case and later, specifically for Cartier, they introduced the Duo-Plan system. This back-wind system had no visible crown or stem to mar the sleek lines of the elongated rectangular ‚Äòbaguette‚Äô case. The dials on ‚Äòmontres bracelets‚Äô were designed mainly with Arabic numerals, although in the case of Cartier, the preference was for Roman; the faces were white or pale champagne. Straps and cases were initially made of platinum until the 1940s when white gold gained in popularity. During the earlier period from 1910 to 1940, straps were often made of grosgrain or velvet ribbon, usually in black or grey with diamond-set dainty clasps and lugs. A 1930s version by Cartier may contain a movement by Ebel, and a horizontally elliptical white face bordered by diamonds and black onyx lugs. The black ribbon strap provides additional contrast. Popular motifs in art deco watch designs consisted of simple geometric shapes, linear edges, and sumptuous repeated link patterns that dominated the designs of rings, brooches, and necklaces. Platinum was the metal of choice to frame the square or rectangular dials. Fancy-link straps were set with symmetrically arranged diamonds of multiple shapes. The baguette cut was introduced in 1922, becoming an instant hit that appeared in nearly every diamond-set watch thereafter. For added contrast and to accentuate the design, black enamel, black onyx, and synthetic sapphires were ubiquitous. For the more upscale pieces, calibre cuts were charming accents, as were jade and coral. Sometimes the bracelet consisted of a mesh strap of platinum bordered by diamonds. These designs are often preferred by modern-day wearers; the integrated, seamless style seems more timeless, pun intended, than the 1950s and ‚Äô60s models with tiny circular cases or squared, slightly convex sides attached to skinny black double-cord straps. In many later pieces, the actual watch face is incidental to the design‚Äôs overall look. It‚Äôs the bracelet that carries the impact. Rose gold was the preferred metal by the 1940s and designs flowed with curved motifs inset with square or round cases. Watch faces were hidden beneath ingenious gem-set sliding shutters or concealed by hinged covers. Alternating rows of diamonds might be adjoined to rubies. Retro 14-karat pink gold watch circa 1940, with hinged cover, hidden dial, twin flat serpentine bracelet, rubies, and diamonds. The best jewellery designers and watchmakers worked in tandem to create items that not only told time, but were beautiful objets d‚Äôarts. From Boucheron, circa 1937, came a novelty watch created with a petite, elaborately chased spherical globe that rotated between pivoting arms. Imaginative and industrial, the interior circumference was adjustable as the two arms of the bracelet could be worn multiple ways with only a minor adjustment. Inspiration for designs, then and now, came from botany, art, and mythology. Cheerful, bright, and sprinkled with diamonds, Cartier‚Äôs tutti-frutti bracelet watches were decorated with carved ruby, sapphire, and emerald leaves, berries, and flowers, all inspired by the richest Moghul jewels from India. 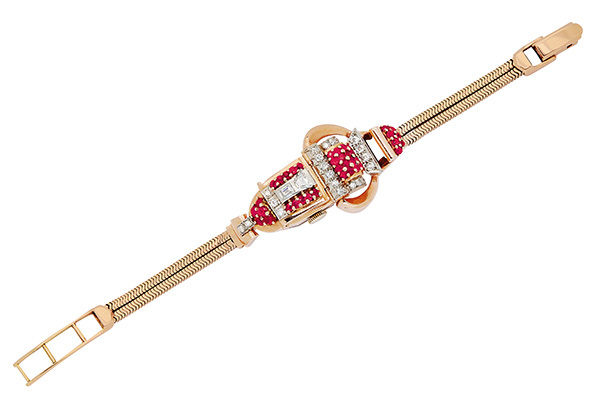 Recently, Cartier reinterpreted this design as part of an exclusive collection. One example has a large, flat hexagonal ruby carved with a floral motif decorating the hinged cover that twists to hide the dial. Another new version of a cocktail watch from Cartier is a sculptural fantasy exuberantly laden with diamonds. For the modern Miss, Mrs. or Ms.
An intriguing selection of dressy styles has evolved for a lady of leisure. Bulgari‚Äôs diamond-studded Parentesi models and Chopard‚Äôs whimsical ‚ÄòHappy Diamonds‚Äô elephant also happen to have convenient quartz movements. Patek Philippe has a version with the dial, bezel, and strap completely encrusted with pav√©-set diamonds and emerald accents. And it‚Äôs easy to tweak the traditional and make a fun fashion statement by combining two or three of the narrow period beauties stacked slightly askew and off-kilter on the same wrist. It‚Äôs short-sighted to ignore these esthetic marvels of micro-technology. If the dial‚Äôs too small to read, take a quick peek at your cell phone. The guys only get to drink cocktails. Advantageously, the ladies have the option to wear one as well.